Schell’s sizable introduction was testimony to a truly rare understanding of a most unusual peaceful civic mobilization now suppressed by the military regime back home. And as I undertook to write my very first piece for a sociological journal in English, it was unnerving to realize that I had not known who the introduction’s author was. So immediately thereafter, determined to catch up, I read Schell’s instant classic The Fate of the Earth. And by the time I met him for lunch six years later, I had been following his writings in The Nation and begun to feel that I knew who he was. As we sat in some small café near Union Square, I remember we talked – in the context of Michnik’s commitment to dialogue and Solidarity’s commitment to non-violent, “self-limiting” revolution — about “angerless wisdom”, something he had referred to in his introduction, and I realized that although this was not Warsaw, Prague or Budapest, I was in the presence of a dissident. Thrilled as I was, I had no idea that this quietly engaging, at once distinguished and boyish-looking dissident thinker would soon become such an active part of my home, the New School, and contribute so much to our TCDS lectures, seminars, summer institutes, conferences, and publications over the next two decades. Writers write books and publish in journals, and this is how they are known to their publics. But thinking about Jonathan Schell I wonder how many of the seemingly “lesser things” he did that did not necessarily produce visible products but had a huge impact on the lives of others, are actually treated seriously and remembered.… I would like people to know that as much as Jonathan might have been a writers’ writer, he was certainly a citizens’ citizen, in my opinion a persons’ person, and a precious touchstone for the students he taught, and for many of us at the New School. I remember him in the fall of 1996 talking with a group of scholars from Russia who were worried about some merely formal measures being introduced to move their country from soviet-style socialism to democracy. (They had come for an intensive program designed to help them transform themselves from professors of Marxism-Leninism into political scientists.) In response Jonathan proposed that we create Partners for Civic Journalism, a program of curricular innovation at regional universities in Russia. It never happened, but the resulting ethos of civic-minded journalism – he argued — would have extended beyond academia and ultimately helped the public to recognize their role in newly-formed democratic institutions and practices. Soon Jonathan, a student of Hannah Arendt, joined our Committee on Liberal Studies, where he taught with Katha Pollitt and Christopher Hitchens in a new program on critical journalism. His presence here reinforced our own mission: he saw the university as a place to study the classics and do basic research, but also as a place to build bridges between academia and the “real world”, in part through informed public discourse about things that concern us — whether it’s the “us” in America, or the “us” in Rwanda, or in Vietnam, or Poland, or Kosovo. After the end of the Kosovo war Jonathan traveled for our Democracy Seminar to Prishtina, where in a hall packed to capacity he discussed with young intellectuals the challenges of post-conflict situations, helping to re-connect them with the outside world. 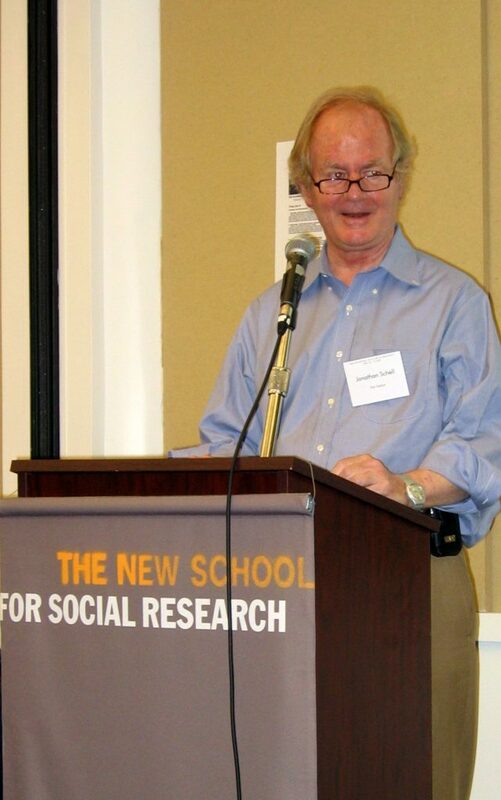 For many of us at the New School, Jonathan was not only a writer, but an important embodiment of the idea of the modern transdisciplinary and transborder university, whether discussing with foreign scholars at our Reading America institute the constitution at work (two impeachments — Nixon’s and Clinton’s), or the challenge of writing on political elections in the media age, with its rapidly shifting forms. And his books – in my case it’s The Unconquerable World: Power, Nonviolence and the Will of the People — are an important part of our curriculum at NSSR. Jonathan’s classes, exceptionally participatory, were truly phenomenal: he dialogued with us, sharing his soft-spoken, yet robust views always aimed at a peaceful reconciliation of conflicts. We discussed the political philosophy of Alexis de Tocqueville and Benjamin Constant, and… the cultural phenomenon of Monica Lewinsky. Without splitting high theory from complex reality, Jonathan was introducing us to his practice of informed, sophisticated, ethical commentary, and initiated us into rigorous analysis that was not divorced from social engagement. We felt that we got from him what’s best in journalism and academia alike, in the U.S. and beyond[ii]. Thank you Jonathan – and our thoughts go to those closest to you. [ii] Pawel Leszkowicz, professor at Poznan University, and Tomek Kitlinski, University of Brighton & Maria Curie University in Lublin. Their essay written for a Jonathan Schell seminar at the New School, Monica Dreyfus, was published in Our Monica, Ourselves, New York University Press, 2001.